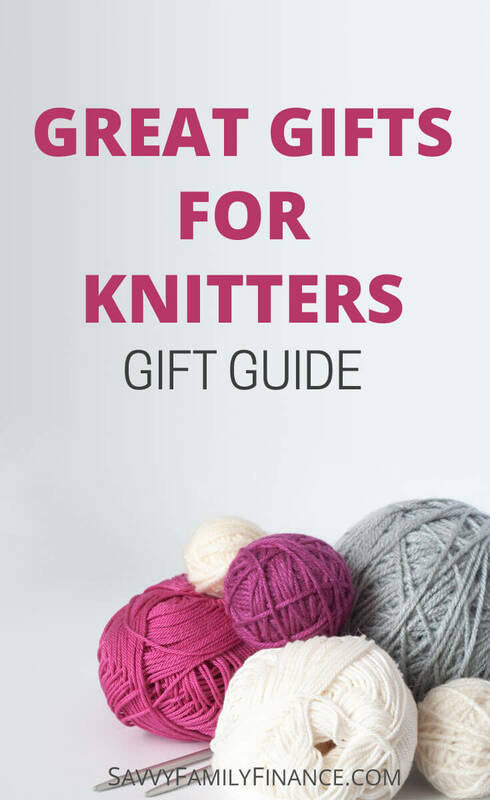 Inside: Find gift ideas the knitter on your list will love. Does someone on your gift list like to knit? Finding gift ideas for a knitter can be tricky if you aren’t one yourself. Knitting is a hobby that has become popular once again and a whole new army of knitters praise the fact that it is useful, relaxing, and engages the mind. This gift guide for knitters has items ranging from stocking stuffers to useful tools to things the receiver will use for years to come. You’ll find options for both the beginner and more advanced knitter. Needles are essential to knitting. This gift of sampler needles is for the beginner knitter or someone that wants to try some new needles before committing to a complete set. The Knitter’s Pride line is well regarded yet affordable. If you would like to put together your own needle sampler, then you can choose individual needles from various lines. US size 8 (5mm) or size 10 (6mm) are good basic sizes. Pom poms are fun to put on hats and other projects. The downside is that they can be difficult to make by hand. These handy tools make it easy and provide consistent sizing. Once a person begins knitting, they realize how much little “stuff” they need. This accessories kit is a good start. It includes tip covers and stitch holders so stitches don’t fall off the needle when you put the project away for awhile, stitch markers (which get used all the time), a simple row counter, and more. This is an absolutely adorable and functional gift. A needle gauge helps a knitter ensure she is using the correct size needle for the project. Knitting kits are great because you have the pattern and all the yarn ready to go. Knit Picks has a great selection of pattern kits as does WEBS. A note: blankets as a project look great, but take forever to knit. Other types of projects would make great gifts, though! Every new knitter needs a book to refer to when learning something new or when, oops! something goes wrong. This book is great at explanations and the illustrations are very clear. Knitters like to be able to carry their projects around to work on elsewhere. I’ve gone to knitting groups at houses, yarn stores, coffee shops and even brewpubs. On forums, many users like this bag because of its size and all the pockets inside for storing various accessories. Knit blockers are great for helping a knitter lay out her project after washing so it looks professional and finished. This set gets great reviews and is easy to use. You can consider this a step up from the standard T-pin. Once you are done knitting a project, you need to wash and block it. This means having to put a wet project down on a flat surface, pin it to shape and let it dry. Without blocking mats, this means many knitters pin projects to spare beds, on a carpet, or other hacks. Blocking mats let you pin the project to foam mats and you can then even prop it up out of the way against a wall while the fabric dries. The interlocking mats mean you can configure a large square for drying sweaters, a wide rectangle for scarves or shawls, or even just use 1 square for mittens. Do you have a committed knitter on your list? Then a swift and ball winder may be the next “must have” tool on their list. This lets them take hanks of yarn, set it up on the swift, then wind the yarn into a ball with the ball winder. Before you buy, make sure your knitter doesn’t already have one. Can only afford one or the other? Go with the swift. There are some knitters that like to keep it simple when winding balls of yarn. A nostepinne is a tool to make this task easier for those that don’t want a ball winder. Normally, I would say to not get a set of needles because each knitter develops a strong preference for particular needles. Sharp vs. not, metal vs. wood, straight or circular, and even the type of cord. With that said, if a knitter has hinted (or straight up said) that she likes a certain brand and type of needle, a set is an excellent gift! My favorite needles are Chiaogoo Twist because I can have a large range of tip and cord sizes at hand, the points are “sharp”, the cord is supple, and they have lifeline holes. They are made of stainless steel, which is great for those with nickel allergies. They do have both 4” and 5” tips available. I love this set, but you can also find individual pieces if you are wanting to try one. They also have their Spin line for those that prefer wooden knitting needles. A yarn bowl is not a necessity, but it is really nice to have. What is it? It provides a place to put your yarn where it won’t roll around or onto the floor as you work. The swirl? The yarn is threaded through there so it consistently comes from one point as the ball unwinds. Yes, there are inexpensive ways to accomplish the same task, so few knitters buy this for themselves. It is a gift that knitters love to get. This is a gift useful both in the kitchen and for a knitter. Why? Being able to weigh yarn precisely lets you easily determine how much yardage is left in a skein of yarn, or how much was used in a project. When all else fails, or if what your knitter really wants is yarn, then a gift card is the way to go. If she has a favorite yarn shop in town, go and get a gift certificate there. Otherwise, a couple great online shops include WEBS and Jimmy Beans Wool. Unless your knitter has spelled out EXACTLY the color, weight, brand and amount of yarn, do not buy yarn. It’s another one of those things that the enthusiast needs to choose herself based on the project and preferences. Gifting hobby supplies is a great way to show someone you care. What knitting gifts do you like?